The allure of super cheap monthly web hosting can turn your website project into a hassle. Cheap low quality hosting providers often stick your website on a shared, over crowded and under performing server. Its like living in a high density building that lacks the minimal standard of services to make living bearable. Have you ever been in a high rise tower with only one working elevator? It isn’t fun. When your website stalls to a crawl no one will want to spend time on it. This may not have anything to do with your domain either. Other domains on the shared server might be getting thousands of hits an hour using up all of the server's resources. This affects your website. There's also no joy when you are trying to publish content and save your work when it takes forever to refresh the pages of your site. If you are serious about your website pay for decent web hosting. There’s lots of good hosting companies out there. Do your research and pick one that offers good value for your money and is right for the software that you will be using. Make sure the one you choose has a reputation for being responsive and easy to get help when you need it. Free things are nice but don’t be tempted to get any free template from a site you know very little about. Just because it looks good doesn't mean it is. Unscrupulous developers can insert malware in illegitimate or ripped off templates from respected businesses that will create links to all kinds of nonsense such as pornographic sites, pharmaceutical scams and heaven knows what else on your site and embarrass you. Worse things can also happen causing serious damage to the server or even just be super annoying to get rid of when discovered. If you are going to use a template, other than the ones that are provided by the CMS you are using, get them from template clubs or developers that have a good reputation. Reputable template clubs also offer support and information that can elevate your website into something you are really proud of. Many of the top template clubs will often have a free template you can download from them. Usually their club templates are very inexpensive anyway. You want a rewarding experience instead of the frustration of finding out you’ve been taken advantage of. Never get your template from a pirate or warez site that offer free or low cost templates they stole from the good template clubs. When you do this you are putting trust in someone or a company that doesn’t deserve it. Backing up your website on a regular basis is the best insurance. If you do not take responsibility to implement a robust backup strategy you have no one to blame but yourself when things go wrong. Will things go wrong? If they do, having a restorable backup will save you time, money and the stress associated with recovering from a disaster of any sort. Noticed I said ‘restorable backup’. Just because you made a backup doesn’t mean it will be automatically restorable and bring your site back to a previous version when needed. Backups need to be tested to ensure they will indeed be restorable. The planning of your website must include a solid backup plan. There’s great backup software available for every CMS. The best of them will not only backup your site but also upload your backup to a different location than the web server your site is hosted on. That’s a good idea because if your backup is on the web server that has a problem and you can’t get to your backup then it’s not very useful. Good and inexpensive off site storage is also available for your website backups. These are an integral part of a solid backup strategy. An extension for a CMS is something you install or upload to your website that extends the functionality and capabilities of your core software. Resist the temptation to install every kind of cool third party extension you can find for your website. This is an invitation to open the door for big problems. Not everyone who writes code for your CMS is using best coding practices. Some actually do truly baffling things. I remember being called to look at a website for a business that said they were having trouble creating a simple menu item for their Joomla! site. Creating menus in Joomla has always been one of the easiest things to do and also a terrific reason to use a system like Joomla. In their case the developer who created the menu system for the website in question didn’t use Joomla's menu capabilities at all. The developer created a Flash based menu system because it looked cool. It made using that Joomla CMS no better than working with a static HTML website. Part of your due diligence when researching the extensions you want to use on your website is to learn all you can about who is writing the code for them. If an extension is not done properly there is a potential for software conflicts or security vulnerabilities to become inherent in your site. Someone could exploit a vulnerability and get control of your website or even the entire web server and create all kinds of havoc for you and others. Will the developers or companies that created the extensions your site depends on be there for you in the future? When your site software needs to be updated and there is a big change in the way the code works will they be ready in a timely matter with an update of their extensions for your site? Will you continue getting the support and help you need? This will make a big difference in the success and joy of your website down the road. When you create a website you must take responsibility for it. Keeping your website software up to date with the most recent security patches is the most responsible thing you can do. Software is updated for a reason. Some of it is to give you new features, however, a lot of it is to fix bugs and shut the door to potential vulnerabilities that are discovered in the software. This applies to both your core CMS software as well as all your third party extensions. Beware of customizing the code for your website or any of its extensions in such a way that they can’t be updated in a timely manner. By using best practices when customizing the software it will allow you to maintain your customizations as well as keeping your software secure. Leaving old versions of software on the same server is also a big security risk. Don’t do it. Your site or server can be hacked through old websites or even unused extensions that you let become obsolete. Uninstall and delete any extensions you are no longer using. This is the kind of thing people with malicious intent go looking for to make your life miserable. 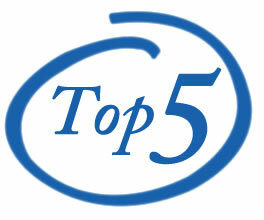 Heed these top 5 tips for your web site. They are a solid foundation to work from and will serve you well.